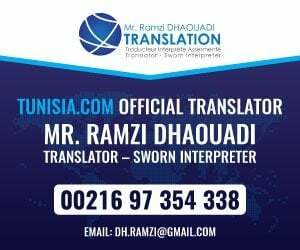 My name is Ramzi Dhaouadi and I am the official Translation partner of Tunisia.com. I have held this position for a number of years now and I have worked with hundreds of expats and investors in Tunisia either resolve their problems or make the most of their visits here. I hold the position of “Sworn Interpreter” for the ministry of justice in Tunisia. • My Translation work is accepted by embassies, and courts in Tunisia. • I am security checked and cleared by the government of Tunisia. • I am able to attend court as an interpreter. My office is located in the centre of the beautiful northern city of Bizerte, a short motorway trip from Tunis. If you are based in the Capital or in other cities I am also able to help and I am often in Tunis visiting embassies or meeting clients. Documents can be sent either in person or via rapid post please call for details of time required for your translation project. To contact me please click on the button below.